I stand before you as the proud mother of an official 7 year old big guy! It’s hard to believe how quickly time passes. This year instead of throwing a big ol’ backyard bash, or spending gazillions at the local hot spot for kids, I decided to keep it low key, I let him have his very first slumber party, and he loved the idea (score)! 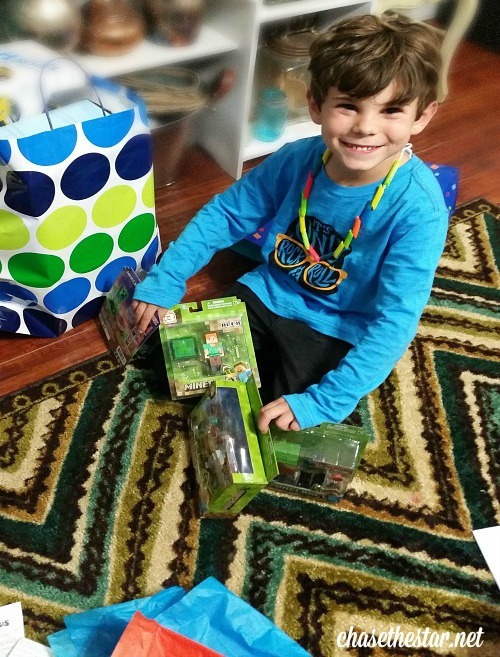 He chose the Minecraft theme (every kid’s obsession these days), they still had pizza and cake and all the other party staples, and they went home with goodie bags that I filled with all sorts of fun stuff including a personalized Minecraft pillowcase. I wasn’t sure how a bunch of 7 and 8 year olds would react to a pillowcase party favor at first, but when I passed them out that night the kids were thrilled, Mom scores again! The pillow cases were simple to make using black glitter iron-on vinyl, and my Cricut Explore. 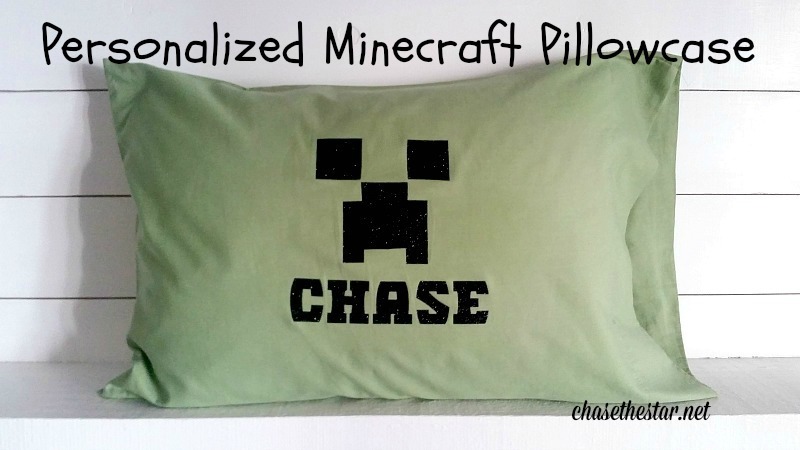 Simply download a Minecraft Creeper face to your machine, select the font you want for your name and make your design. Cut it out and iron it on. Total time to make all 8 pillowcases, about an hour and half. For more info on how to use iron-on vinyl click here. We had a total of 9 kids including my 2. My husband was horribly ill with the flu, but it was too late to cancel, the show..er..party must go on! The trick is to keep it simple, and not over think it. 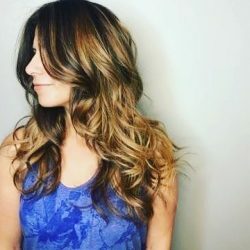 As Moms we want to make sure every single detail is perfect, original, and beautiful. At the end of the day, kids just wanna have fun! I took it easy, planned ahead of time and enlisted help. The first thing I thought about was his outfit; I wanted him to wear stylish but comfortable clothes. At 7 years old he needs to be able to run around and play, while still looking cute for his pictures! I got him this cool new outfit from FabKids, I looove their adorable apparel and great prices! They have a service where you can subscribe and get a brand new full outfit every single month for just $29.95. Super cute stuff for both boys and girls, can’t beat it! 1. Keep the decor simple. I kept the decorations to a minimum with a few free printables I found online and basic party supplies. I sent the printable files to a local print shop and spent about $8 for everything (water bottle labels and birthday banner). Note: Use the same ‘Creeper’ design for your goodie bags; simply adhere to green gift bags! OR if you have black duct tape you can manually cut out the squares and rectangles. I used Frog tape to keep the banner up without damaging my walls, it held up perfectly and it matches with the rest of the decor! 2. Keep the food simple too! I had my local grocery store make the cake, which I propped up on a cake stand I already had. I picked up pizzas, served chips and ice cream, and made jello (green of course). I also ordered cake pops from a local vendor, they were so cute and delicious! I didn’t take the time or energy to make anything from scratch. It was so nice to know that everything will be taken care of and if I plan well, it won’t cost much at all. 3. Enlist help. With my husband being so sick I was on my own, so I made sure my dad was there with me to help manage the kids. This age group can get a little rambunctious 🙂 Having 2 adults there made all the difference, thanks Dad! 4. Try to contain the group in ONE room if possible: We have a large kitchen and dining room combination space so I moved my table to the corner at an angle with the chairs against the walls. That was the ‘party table’ or focal point, while the kitchen island was used for serving. This left tons of space for the kids to eat, jump, play, and everything else. While they spent time in my son’s room and of course our living room and yard, most of the party took place in this room, which made for easier clean up and monitoring! 5. Keep them occupied AT ALL TIMES. A couple of the kids weren’t coming until later so while we had just the first 7 kids, we piled them up into 2 cars (safety first, and parents gave permission of course), and headed to the local bowling alley! It was pretty inexpensive to reserve one lane for an hour plus shoes (about $50). They had a blast and used up lots of energy! 6. Plan every hour: Back at home the kids had pizza and then we cut the cake. While they ate, I set up a simple ice cream bar: sour gummies, M&M’s, caramel, chocolate sauce and whipped cream. I served each kid one by one. In the meantime, I cleaned up the cake messes and started to plan our craft (come back for the details!). We made a simple craft, then it was time for presents! Later some gaming; they took turns playing Minecraft while I cleaned up some more. There will be lots of cleaning up! Lastly it was time for everyone to get in to their jammies, and settle in to watch a movie. 7. Plan on at least 1-2 movies. This is a party, kids are hopped up on sugar and they will be up late–you are officially warned! They were sprawled out on sleeping bags on our living room floor and almost all were asleep by the end of the second movie. 8. Plan for day 2: While the movies were playing I set out the griddle, pancake mix, spatula..everything I needed to make breakfast the next morning. I set the table and headed to bed only to be awoken by loud giggling at precisely 6 a.m.
9. Go to bed as soon as they are all mostly asleep. If you wait for every single one to fall asleep you may be up all night! Make sure that the last couple of kids that are awake know to stay put, talk quietly, and no t.v., etc. Everyone up, fed, dressed, and sent outside to run around and play some more before their parents picked them up. The kids slept on their new pillowcases so I removed my pillows from each and put them in the goodie bag along with leftover cake pops, AND a leftover wrapped water bottle. They got to take some “potion of healing” home, and they loved it–go figure! 10. Set the pick up time for early the next day: We had baseball team pictures the next morning so I asked parents to pick their child up by 9:30. Little kids get up early so there was plenty of time to enjoy themselves before mom or dad came. This gave me enough time left in the day to clean up, throw some laundry in the wash, and do other typical weekend type stuff. That’s duct tape (duck brand) wrapped around plastic silver spoons set in an updated tray. Boom–easy! All in all my son had a FANTASTIC 7th birthday party! He got to spend tons of time with his buddies, ate lots of junk, and even got some presents. What more can a kid ask for? As for me, my kid was happy, I survived hosting a 9-kid sleepover with flying colors, and he looks adorable in his pictures to boot? Doesn’t get much better than that! 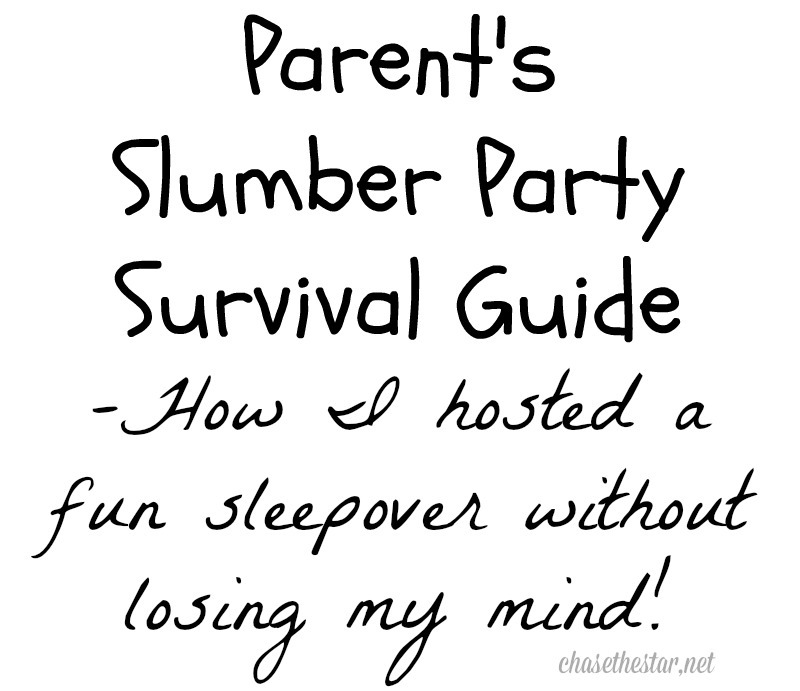 Now that you have the official sleepover survival guide, would you host a slumber party for your kids? 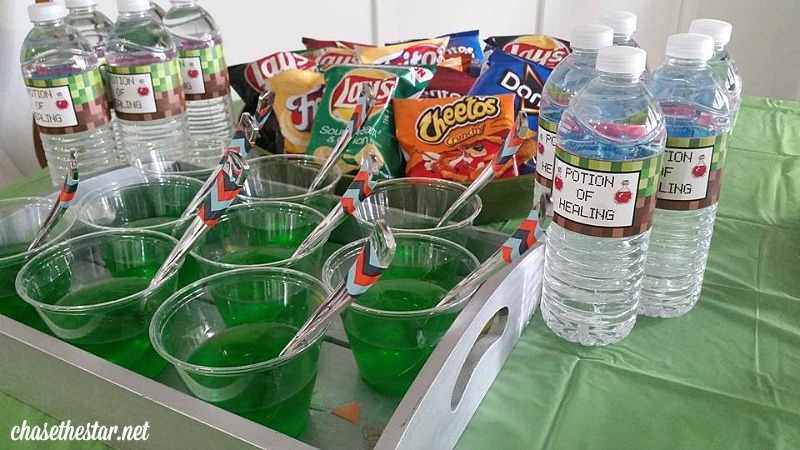 Want more party ideas? Click here! 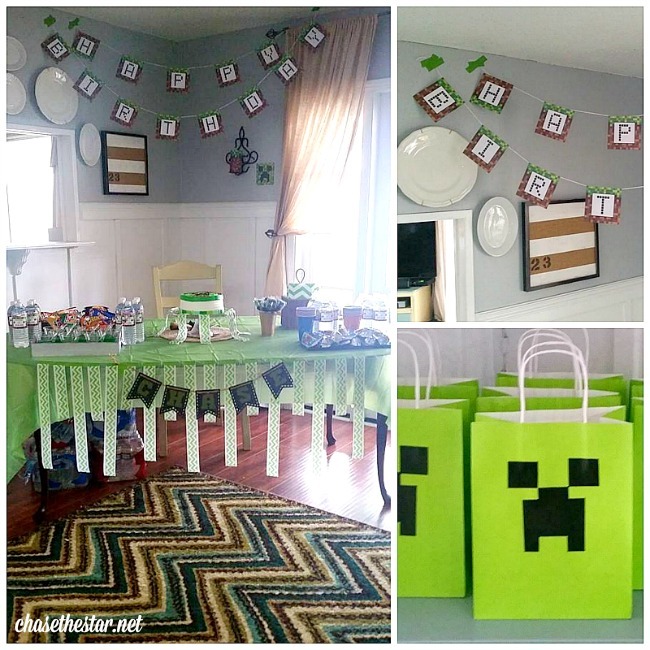 Find the Minecraft party printables that I used here! Outfit provided by FabKids. All opinions are 100% mine.